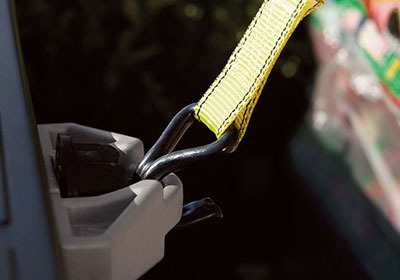 With features like staggered, outboard-mounted shocks, heavy-duty TripleTech frame with integrated towing hitch receiver—plus a trailer hitch that utilizes 12 high-strength bolts integrated into the frame—Tundra's i-FORCE 5.7L V8 has the available brawn to help you tow over 10,500 lbs. A combination meter—which includes a voltmeter, coolant temperature, fuel and engine oil pressure gauges—helps you keep an eye on your Tundra's vitals. And Tundra has been SAE J2807-rated since 2010—adopting the standard tow ratings as set by the Society of Automotive Engineers (SAE). Toyota Racing Development USA (TRD USA) has been building high-performance Toyotas since 1979, and we've used this know-how to create our most formidable truck yet—the Tundra TRD Pro. Built to dominate extreme terrain, Tundra TRD Pro kicks things up a notch with specially tuned Bilstein shocks, unique off-road wheels and tires, a heavy-duty skid plate and an aggressive TRD-tuned exhaust. It's the same factory-engineered toughness that proved itself by winning its class at Baja in 2014 before conquering Chile's most fearsome volcanoes and the Arctic Circle in the dead of winter. Let's show the world what a full-size truck is capable of. There's no need to choose between comfort and capability. The Limited CrewMax is equipped with first-class amenities like leather-trimmed heated front seats, a leather-trimmed tilt/telescopic steering wheel, the advanced Entune Premium Audio system and first-row-passenger power seating. 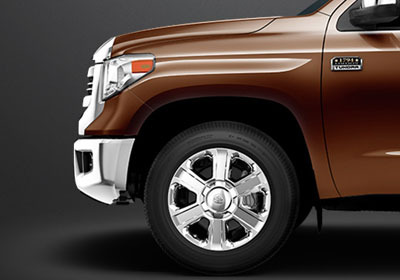 It's just one reason why Tundra is the perfect partner for both the job site and a night on the town. After a long day of work or a long haul to the perfect boat launch, it feels great to stretch out. 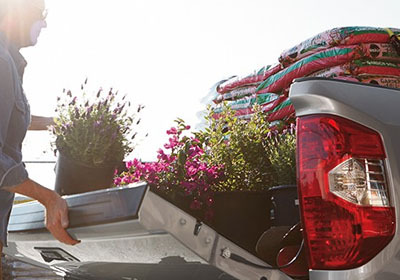 Your crew, and your family will appreciate the extra space. And to help add an open feeling, CrewMax models include a standard power vertical sliding rear window and available moonroof. The customizable 3.5-in. Multi-Information Display provides odometer, trip meter, instant/average fuel economy, distance to empty, average speed, trip timer, and an Integrated Trailer Brake Controller monitoring screen (5.7L V8 models)—all this right where the driver needs it most, right in front of them.